graduating sizes, starting with a 3/4"x1-1/4"bead. Clasp marked Austria. Excellent condition. individually tied. Excellent condition, neat beads. Pressed/molded(?) glass beads, cool pale coffee color with copper flecks. Western Germany, 18" long, necklace. Two toned glass, crystal faceted, 8mm green & white beads. Well made 24", two strand necklace with 8mm,mother of pearl disc beads and jade glass beads. Mother of pearl 3/4" beads, two strand 36"necklace. Clasp marked Japan. Nice old necklace, shows a little wear. 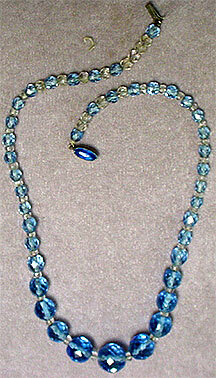 The blue crystal beads are an unusual color and in excellent condition. Some of the necklaces are signed Czechoslovakian. Most need to be re strung, but the glass beads are really neat. Beautiful yellow vintage 15" necklace and earrings. Vintage red and black 14" choker. Vintage Czechoslovakian 16" red glass bead choker, faceted glass clasp. Vintage Czechoslovakian 16" blue crystal glass bead choker, faceted glass clasp. Vintage nice chunky 14" choker, this item has been re strung. Vintage 22" necklace, unusual beads, has been re strung.